MEXICO CITY -- A missing Mexican priest was found shot dead off the side of a highway in western Mexico days after he was kidnapped from his parish residence, state prosecutors said Sunday. 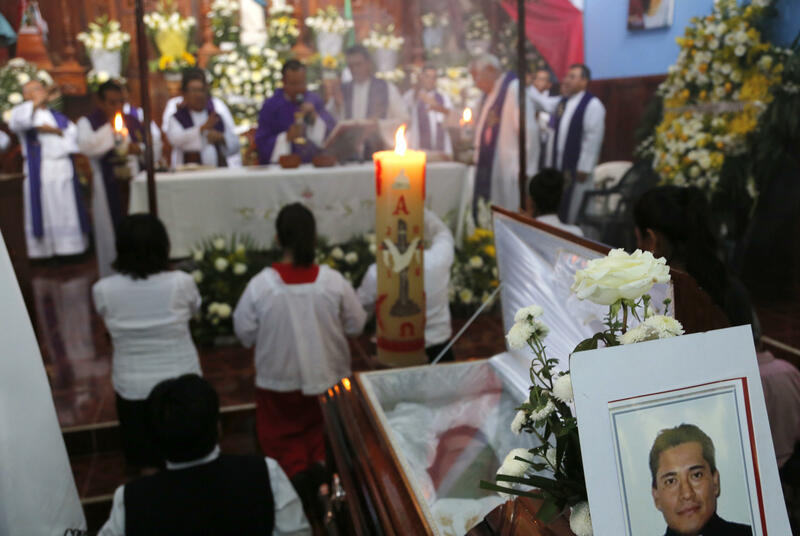 He was the third Roman Catholic priest to be slain in Mexico in the last week. The Michoacan state Attorney General’s Office said in a statement that the Rev. Jose Alfredo Lopez Guillen’s body was found Saturday night in an area called Las Guayabas on the highway between Puruandiro and Zinaparo. The Michoacan prosecutor’s office said an autopsy determined Lopez had been killed about five days before his body was found. The Archdiocese of Morelia didn’t announce Lopez’s abduction until Thursday, and Cardinal Alberto Suarez Inda, head of the archdiocese, pleaded for the priest’s safe return in a video message. Lopez’s car was found wrecked Tuesday. On Sunday, the archdiocese reported Lopez’s death through its social media accounts and called on authorities to solve the crime. The state prosecutor’s office said its search for the priest began Wednesday after a relative reported Lopez was missing. According to the office’s statement, Lopez was last seen Monday night when he ordered a delivery of four portions of food that arrived at 9:30 p.m. at the church in the town of Janamuato. Also Monday, Lopez sent a message to a woman who cooked for him telling her that she would not be needed to work Tuesday, it said. The statement said that when Lopez was not seen by his secretary Tuesday, it was thought he was visiting his family. But when he still did not show Wednesday, Lopez’s brothers were called to check. They found his quarters locked, but items were strewn on the floor and two vehicles were missing. No one received a ransom demand for Lopez’s return, the statement said.